Hollywood Treasure, Syfy's pop-culture memorabilia show, is about to get into the real estate business. Having just premiered its second season, the show follows Joe Maddalena and his Profiles in History auction team as they scour the country hunting down (and authenticating) the coolest props/costumes/vehicles/etc that we love from movies, TV and more. 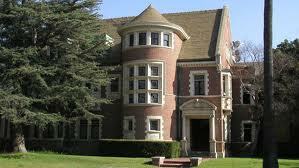 But their newest acquisition, the house from American Horror Story, isn't hard to find. The first season of the bizarro FX network cult hit centered around the house, and became as much of a character on the show as the actors. Now on the market, the episode of Hollywood Treasure featuring the house will air Tuesday, May 29 at 10 PM ET/PT on Syfy. Profiles in History says that construction of the house began in 1904 and was completed in 1908 befoe the Catholic Church added a chapel addition in 1954. The house sits on approximately 3/4 an acre and is around 12,000 square feet. The home was built by renowned architect Alfred Rosenheim and is currently a designated historic monument. The house will be going on the market for $12 million. Maddalena and his Profiles staff will help market the property around the world with Brad Downs of Rodeo Realty Inc. of Beverly Hills, California.